A former California Valley CSD director whom prosecutors previously accused of lying about where she lived is now charged with felony animal neglect. Authorities seized 11 horses from a rural Santa Margarita property in the new case against Misty Marie Lambert. Lambert, 43, kept her 11 horses on a property located in the 1400 block of Arvin Trail in eastern San Luis Obispo County. 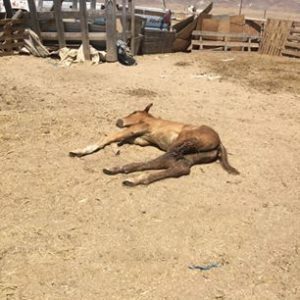 While investigating a report of animal neglect, deputies determined the horses had not been provided adequate food and water for as long as six days and in temperatures in excess of 100 degrees. Additionally, dogs attacked one of the horses at the site on multiple occasions, according to a sheriff’s office press release. Animal workers ultimately euthanized the colt because of extensive untreated injuries. 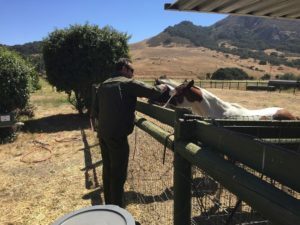 On July 18, deputies seized the horses and transported seven to County Animal Services and three stallions to the Equine Center in San Luis Obispo. Last year, the district attorney’s office filed felony election fraud charges against Lambert and then-fellow California Valley CSD director Lisa Marrone. Prosecutors alleged Lambert and Marrone lied under penalty of perjury about where they live. But, a San Luis Obispo judge threw out the voter fraud case against Marrone, and prosecutors later dropped the charges against Lambert. 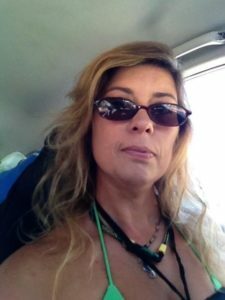 Homeless, but she owns (owned) 11 horses? I own a home, but can’t afford a horse. Priorities I guess. Don’t forget to surround her by a vicious dog or two.